Got a pressing deadline? No problem. We have production and engravers standing by to accommodate your rush award request. We can produce your award order in 1, 2 or 3 business days. Our standard order production takes 5-7 business days and then you add time in transit. Please note that we are closed on Saturdays and Sundays. Here is how rush award production works. 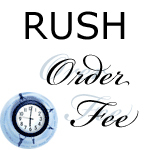 If you place your rush order by 3 pm central standard time, then we can ship your award order the next business day. You must approve the graphic proof by 12pm the next day. Rush order fee for 1 day production is $100.00 per award. If you place your rush award order by 3 pm central standard time, then we can ship your award order in two business days. You must approve the graphic proof by 5pm the next day. Rush order fee for 2 days production is $75.00 per award. If you place your rush award order by 3 pm central standard time, then we can ship your award order in three business days. Rush order fee for 3 days production is $50.00 per award. overtime salaries for fabricating and engraving an item within the deadline provided by the customer. Rush production charges do not cover shipping cost to the customer. Shipping charges are added to the order total and are in excess of rush production charges. Please note that production rush fee is not refundable. rush fee will be billed to their credit card. Each rush order fee covers 1 award or 3 paperweights.